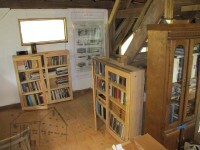 I just finished a few days of production of glazed doors for the library bookcases. It gives me all the more respect for those artisans to make acres of kitchen and bathroom cabinetry. I am not really set up for large scale joinery production, but great progress was made nevertheless. In following Occam’s Razor, the philosophical construct that suggests simplicity as the best answer to a convoluted question, I decided to make exceedingly simple glazed doors using the pile of southern yellow pine I had left over from the barn flooring along with a dozen or so sheets of plexiglass from a house project that never materialized (it actually evolved into a much better one). Of course I overlooked the inverse of Occam’s Razor, namely that the simpler the structure, the greater the need for skillful design and execution. My plan was to build open faced mortise and tenon corners (bridle joints) using my table saw to cut all the joints. In principle the idea was fine, but in practice, let’s just say that a $25 saw from Craigslist is probably not the one you want for such a process (especially when the fence is such a piece of garbage it almost isn’t even worth the effort to throw it out the door). But, it was what I had on hand. 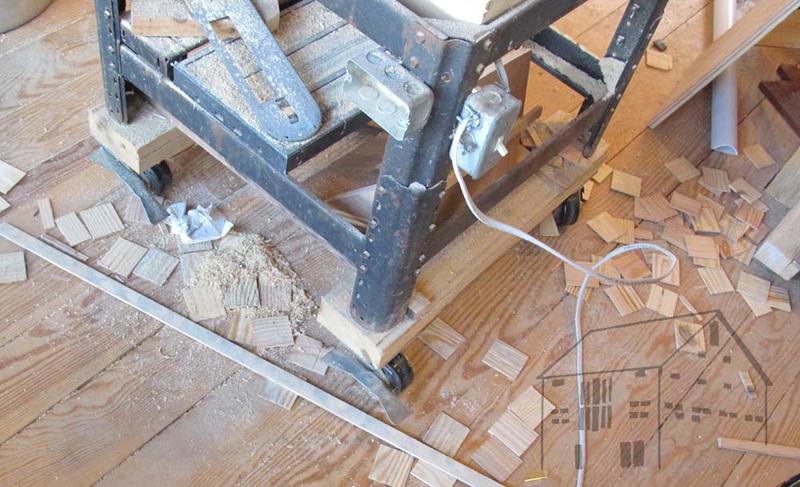 My Unisaw was back in Maryland, along with my home-built but perfectly useable tenoning jig. 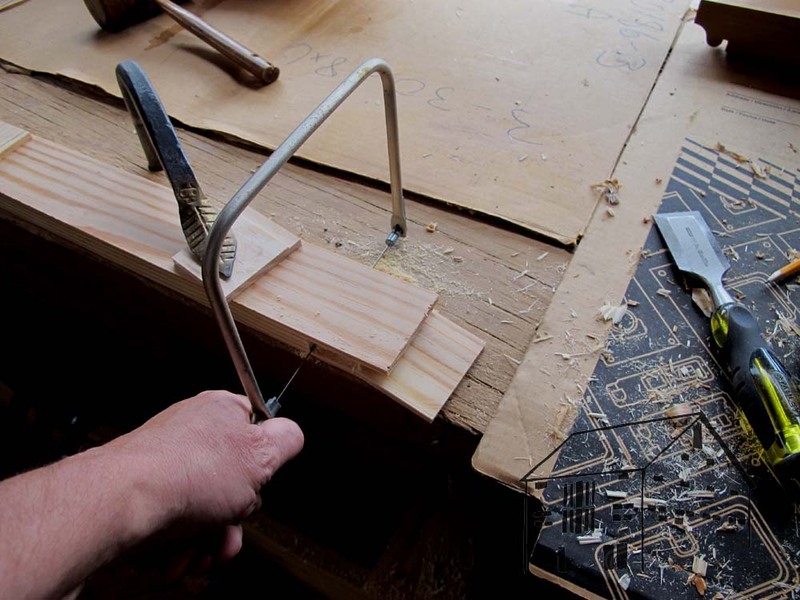 The first thing I needed to do was make a simple tenoning jig, which I did. Then, I cut all the open mortise shoulders on the rails, which were purposefully 1/2″ wider than the stiles. This went smoothly. I was left with several score of identical wooden tiles, which I gathered to save for the myriad times I need a small shim or spacer. Cutting the open tenons was not so easy as the tenon length, corresponding to the wider rail, was deeper than the saw blade could cut when fully exposed by almost a half an inch. Grrr. 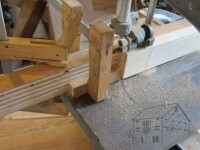 Quickly I set up the band saw to make the necessary shoulder cuts and it went fairly smoothly. Near the end things began to bog down a bit, and you can see why here. Even though well dried (almost three years for 5/4 stock) the rosin in the southern yellow pine was so gooey it clogged the 3/4″ 4 tpi blade. 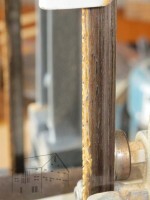 The only reason it worked as long as it did was the friction kept the rosin soft, so the saw blade could still do its work. Once I stopped the pitch cooled and hardened into a rock. I will either need to clean the blade completely or throw it away. Fortunately it is not my only blade. 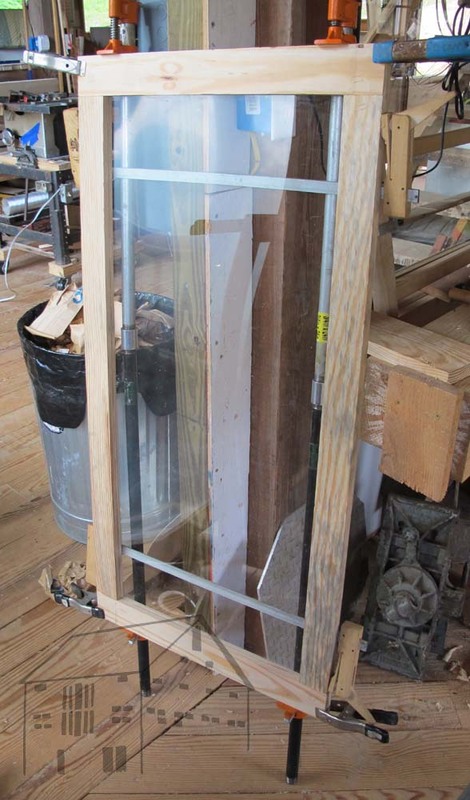 Since the glazing was 1/8″ plexi, and I like fully housed glazing, I ripped an off-center groove on the inside edges of all the door elements into which I would insert the glazing. In retrospect I should have been more careful to line up the groove with the outer edge of the tenon. 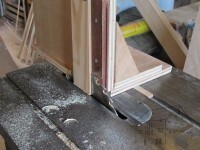 It would have made the fitting of the corners a lot cleaner, but then so would a well-performing table saw. I moved to the work bench, my first Roubo model, and trimmed the shoulders of the tenons and cut the blanks from the open mortises with a coping saw. It literally took only ten or fifteen seconds per mortise. Most of the corners fit together without further attention, a few needed a handful of strokes with the rabbet plane for them to slip together. I then glued the frames together with the plexi sheet inserted, and when dry they were ready for trimming and installation. 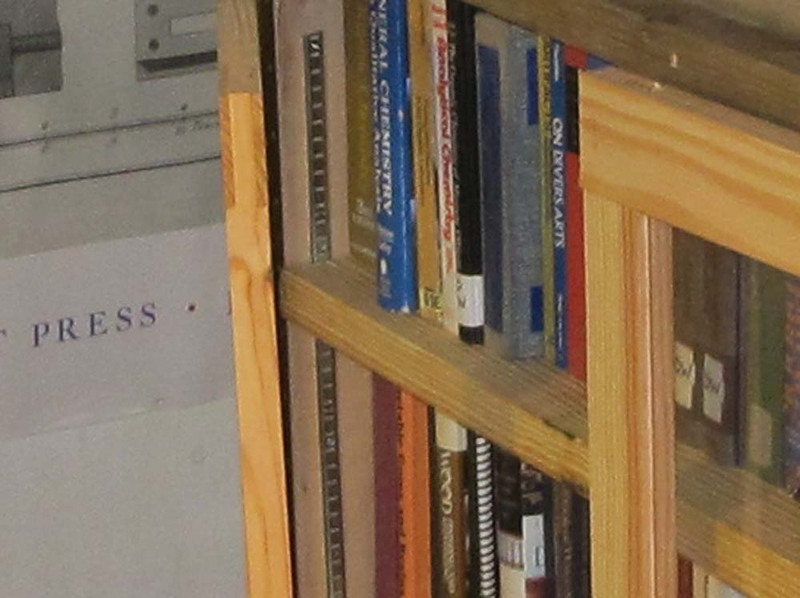 As a sop to motivational psychology, I temporarily installed two pairs of the doors and filled the cases with books. This fatuous gesture was very encouraging. 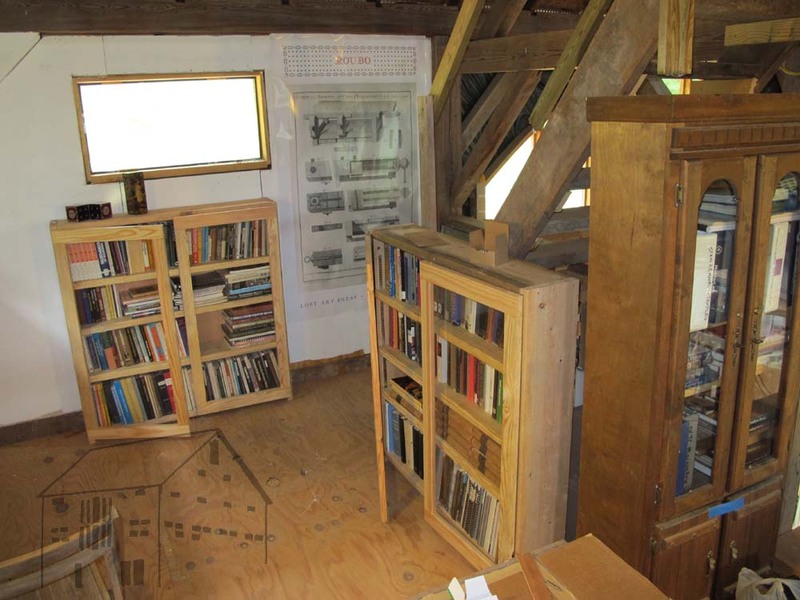 When I return probably at the end of the month I will assemble the remaining doors, and finish the detailing of all the doors before I install them and load the units with boatloads of books.